Barack Obama has been beholden to the Communist Party USA for decades. From the boyhod mentoring he received from Frank Marshall Davis, to support for his 2004 Senate campaign , ongoing work in Chicago and mass party support in his 2008 presidential run. The Party wants Obama to deliver a new "New Deal"-a massive extension of government and union power that will permanently transform US society. By using pressure from the "bottom up and the top down", the Communist Party aims to squeeze the US middle class into accepting its socialist program. 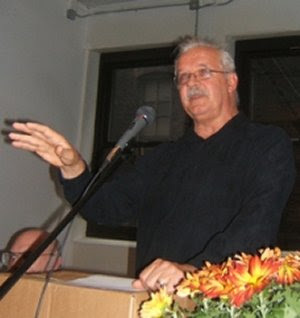 The following is a speech given by Communist Party National Chair Sam Webb, at the PWW’s Better World Awards banquet in New York City, May 17, 2009. On the heels of the first 100 days of our new President, we heard nearly endless commentary and analysis. Much of it was favorable; and some wasn’t. After the first 100 days I would say without hesitation or qualification that the political atmosphere, landscape, conversation and agenda compared to the previous eight years of the Bush administration have changed dramatically. In this new political climate, we can foresee winning a public option, like Medicare, in the current legislative fight over health care reform. We can visualize enacting tough regulatory reforms on the financial industry that brought the economy to ruin. We can imagine bringing the troops home from Iraq and Afghanistan, while being part of a regional process that brings peace and stability to the entire region. In this new political climate, the expansion of union rights in this legislative session is not only sensible, it’s doable. Much the same can be said about winning a second stimulus bill, and we sure need one, given the still rising and likely long term persistence of unemployment with the heaviest burden, as usual, falling on communities of color. Isn’t it possible in the post-Bush era to launch a vigorous attack on global warming and create millions of green jobs in manufacturing and elsewhere? Can’t we envision taking new strides in the long journey for racial and gender equality in this new era, marked at its beginning by the election of the first African American to the presidency? And isn’t the overhaul of the criminal justice and prison system – a system steeped in racism and employing punitive treatment as it organizing principle – no longer pie in the sky, but something that can be done in the foreseeable future? All these --- and many other --- things are within our reach now! We can dream again, knowing that the gap between our dreams and reality is bridgeable. We can turn King’s words --- that “justice roll down like a mighty stream” --- into a living reality for every American. We can re-bend the arc of history in the direction of justice and peace. But only if we, and millions like us, do our part in these struggles, much like we did last year. Neither President Obama nor progressive congress people can do it by themselves --- they can’t be the only change agents. After all, they are up against formidable opposition. On the one hand the extreme right is badly weakened, but is still a poisonous and reactionary political presence in our nation. On the other hand, the Obama change coalition includes people and groups that want to cut down on the scope and sweep of the reform agenda. So both the new president and new congress need our help. Our responsibility is support them as well as prod and constructively take issue with them when we have differing views. But more importantly – and this is the nub of the problem – we have to reach, activate, unite and turn millions of Americans into change agents who can make the political difference in these struggles. Changes of a progressive nature, especially major ones--- if history is any guide ---usually combine the bottom up and the top down. So the challenge facing the discontented of our land is to be the bottom up change agents this year and in the years to come. Our parents and grandparent did exactly that in the Depression years. Not happy with the pace and substance of change, they sat down in plants and in the fields, marched on Washington, petitioned local relief agencies, lobbied for a social safety net, established unemployed and nationality (immigrant) groups, organized industrial workers, opposed discrimination and racism, elected New Dealers to Congress and re-elected Roosevelt in a landslide in 1936, and turned (not all at once and not perfectly) multi-racial unity into an organizing principle. I am confident the American people in their millions – reeling under the weight of this terrible economic crisis and yearning for a more decent, equal, peaceful and just world – will follow their example and turn this country into a more perfect union. Yes we can --- Si se puede! Now you know every major item on the communist party's agenda. Socialised healthcare, increased union power, massive controls on the finance sector, ending the Iraq and Afghanistan Wars, an heavily regulated "green economy", a second "stimulus" bill weakening of the "racist" prison system. Put the Communist Party list on your office wall. Tick the items off as the Obama administration acts on each and every one of them. Isn't this Obama File 77? No kidding. You actually could check the list off, one at a time. You might want to be aware that the Communist Party USA and its "legal" front the National Lawyers Guild are both praising Obama's Supreme Court choice. Though Sonia Sotomayor may seem to be a centrist with her background, with open far left backing however, it would seem like Judge Sotomayor could be a closet radical. Wow, you are have a weak understanding of economics and class struggle if you think those weak social democratic changes are somehow communist. You are out on a limb trying to connect the two. And where is the REAL underlying plan you say is there? Where is the scary boogeyman ?? Where does the govt create a planned economy and take over the means of production? Not for nothing is is now called 'Goverment Motors'. Thanks MAH-I saw the CPUSA piece. that woman merits some serious research. where is the REAL underlying plan you say is there? Where is the scary boogeyman ?? Where does the govt create a planned economy and take over the means of production? Though Sonia Sotomayor may seem to be a centrist with her background, with open far left backing however, it would seem like Judge Sotomayor could be a closet radical.